If you are raising chickens for eggs you will need to have chicken nesting boxes in your chicken coop. 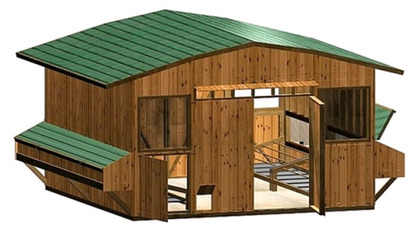 This provides a safe comfortable place for your hens to lay their eggs. Always remember, when we discuss sizes, lengths, etc. nothing is set in stone--use your imagination. You should build one box for every four to five chickens. The boxes can be made out of metal, wood, old crates, or even modified five gallon buckets. I have seen people use old cardboard boxes. Try different ideas and don't get caught up into thinking there is only one way to do things. This goes for all the things we talk about. Most boxes are 12"x12"x12". Each box should be mounted somewhere between 18 and 24 inches off the floor. Just keep in mind that it needs to be big enough for the chicken. Make sure your boxes are below the roosting perch or the chickens will sleep in them. If you are building the traditional type box that you most often see. Make sure you put a sloping roof on it to keep the chickens from roosting there. Also, with any type of nesting box you construct make sure the chickens cannot get above the nest so as to avoid any contamination from chicken poop. Chicken nesting boxes should be kept as clean as possible. You should line your boxes with cardboard or some type of hard plastic for easier cleaning. Then cover with 2 to 3 inches of straw, pine shavings, shredded newspaper or dried grass clippings (make sure the grass clippings are free of chemicals). 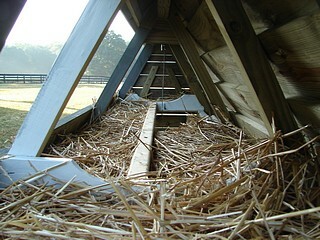 Some coops are designed with doors built behind the nesting box. This allows you convenient and easy access to your eggs. Chicken nesting boxes are not a rocket science project. Just think like a chicken and you will do fine. Chickens just want to find a nice, cozy, safe place to lay their eggs. 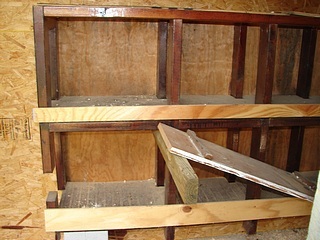 Nesting boxes and perches are an important part of the chicken coop. Just don't get overwhelmed by thinking it has to be a certain way. There are many ways to approach this, just use your imagination. You can do it. Do you still need to build your chicken coop? Just not sure how to find the best plans to help guide your build? I understand and so I went ahead and previewed two coop plan resources. If you're feeling confused about which plans are the "best", then take a look as I narrow it all down.